I've reviewed a fair few laptops in the last year and seen countless PCs in my life but excitement always mounts when something new comes along, and that something was the arrival last week of the new Samsung Series 7 Gamer laptop. This powerhouse of a machine comes with a 17.3 inch full HD, 3D screen and I was very keen to try it out with the latest titles. The machine itself is by far the nicest gaming laptop I've ever come across. It's black brushed metal and plastic case is of a very high standard, the keyboard and trackpad are both absolutely first rate too. There's no scrabble tile keyboard affair here, the machine has the high quality keys you'd expect on a top end workstation. The black glossy lid has a Samsung logo that glows white when the machine is switched on, which is lovely touch and to the right of the keyboard sits a mode dial. This dial has settings for Green where the machine enters eco mode with everything running at minimum and the keyboard lights are off, Library with settings turned up a bit but the keyboard lights still off, Performance where the keyboard lights up with a white backlight and the laptop runs at full speed and the wonderfully cheesy Gaming mode. Here the keyboard lights dim to blue, the white lights atop the keyboard for power, hard drive etc turn blue and red, circular lights appear around the power and volume buttons, a blue Turbo light appears above the centre of the keyboard and the screen momentarily changes with a sound and video animation to signify it's in true gaming mode. All in all this is utterly pointless but tremendous fun nonetheless. 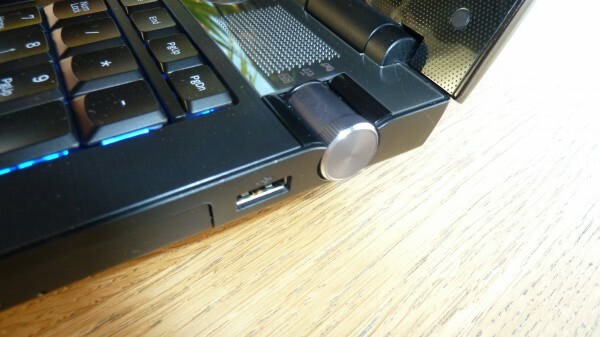 Ports wise it's very well specified with VGA, HDMI, Display Port, headphone and microphone, two USB 2 and 2 USB 3, 7-in-1 card reader and a Gigabit Ethernet socket. 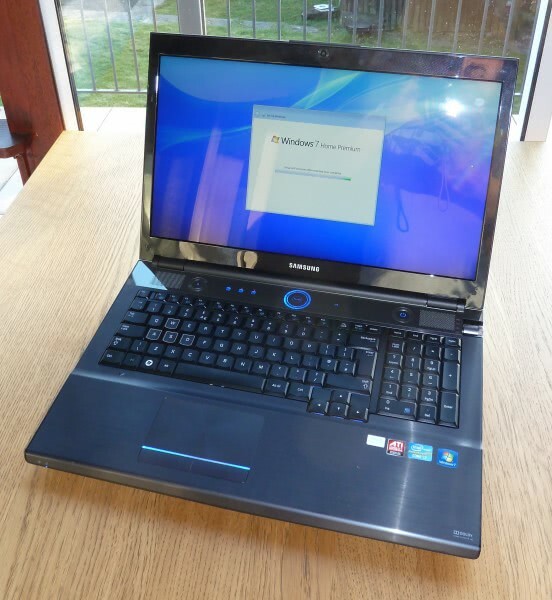 Internally the specification is excellent too with a 2.2GHz Core i7 2670QM processor, a very healthy 8Gb of 1333MHz DDR3 RAM with two free DIMM sockets also available, AMD Radeon HD6970M graphics with 2GB of dedicated GDDR5 memory, Twin 750Gb hard disks, a Blu-Ray drive and that 1920 by 1080 full HD, 3D screen I spoke of earlier. Bluetooth 3 is also included as is 300Mbps WiFi. The screen itself is extremely bright at maximum settings, but this is needed to help offset the darkening effect of 3D. You launch the 3D functions through dedicated software into which you can view movies, DVDs and Blu-Ray discs where it can auto-convert to 3D as well and add in your own games. Don't expect the very newest games to be supported, there's no stable 3D driver for Battlefield 3 yet but both Call of Duty: Modern Warfare 3 and Call of Duty: Black Ops played fine. You need to bear in mind that playing a game in 3D doubles the frame rate so you'll need to sacrifice some quality in the game to keep it stable and playable. In general gaming use the 3D glasses supplied are extremely comfortable and very small and lightweight. They're rechargeable via USB. The darkening effect of 3D though can make it difficult to see distances in games so you can expect to get shot a lot more than on a traditional screen. The general 3D effect however is extremely good and games feel like you're playing something completely new and exciting again. Sound too is excellent through the twin 2W speakers and extra subwoofer. They're some of the best speakers I've ever heard on a laptop. They delivered loud, deep sound that didn't feel tinny or lacking in depth at all. You can expect battery life akin to similar laptops with just around an hour of gaming on a single charge and about four and half hours in light use. This is par for the course with such laptops. The prize comes with the price. I've always been very pleased by Samsung's pricing policy and the Series 7 Gamer is no exception coming in at around £500 (around $700) cheaper than a comparable Alienware. This price coupled with the fantastic looks and build quality make the Series 7 Gamer the best gaming laptop I've ever seen and tested. There's no better choice in my opinion for a 3D laptop. This is the one to buy. The keyboard looks kinda strange, with the cursor keys being one-line down and all. While I’m using WASD I’d figure that cursor-key gamers may have issues adapting here. I must have missed the price, and you should definitely add it to the article. I do not know how a comparable Alienware laptop costs. I have waited about two months now for a Samsung Serie 9 Ultrabook to come out, and decided to get an Apple Macbook Pro instead when the refresh comes out. Sorry Samsung, but it is taking just too long this time, and no information on availability is another no-go. Also, I’d like to know the form factor, weight, screen size and all that good stuff. Thanks for the update Mike. So it is a desktop replacement more or less, which makes battery life less important. 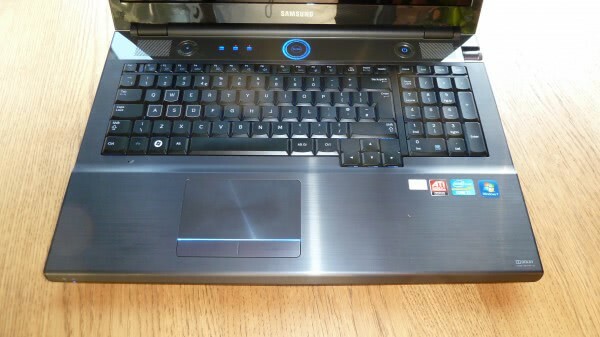 you gave us a nice review on the european version of the Samsung series 7 gamer laptop, any chance for a review of the US version? One thing no one ever seems to mention when reviewing computers is the Windows Experience Index. Ignoring the gimmicky 3D nonsense (which probably costs you an extra $100 to $200) and telling us how the Series 7 fares in WEI would be useful; we could get an immediate comparison with other machines. For example, my current desktop machine reads 7.3, 7.4, 6.8, 6.8, and 5.9 top-to-bottom. How does the Series 7 compare to that? Good question, my PC has 7,4 7,4 7,8 7,8 7,8. There are several reasons for this and why reviewers don’t include the WEI score in reviews. Firstly and most importantly they change form one Windows version to another. I have a laptop here where the variations in WEI between Windows 7 and Windows 8 are surprisingly large on the same machine. It’s also not a good way to determine how suitable computers are for particular tasks. A high 3D graphics score for example might signify to some people that they can play the latest games, but the processor, memory or hard disk might not be fast enough to support them. Thus the 3D score is misleading in this context. You’ll find that reviewers would rather list the actual hardware and it’s speed, such as my mentioning the graphics card in the laptop in this review as this is a better way for people to judge how much of an improvement the hardware will be over their existing machine. These are the generally accepted reasons anyway. I am currently looking for a new laptop with a similar feature set to this, but unfortunately it has what I consider a major flaw. A glossy screen. Why do manufacturers insist on diminishing the usability of their product, especially when it probably costs them more? Buggers; thanks for that ( glare screen ;) tip, mate. Still looking for best price/value DTR laptop (i.e. Qosmio/Asus/Alienware/Custom/Etc), as well, with MATTE screen, of course. Very confusing, what with the variations. I can use any possible help in making a decision, if you care to email me when you find one. TIA. can be it posible ? if yes plese tell me it’s price.